The world is changing. Nowhere else is this more apparent than in the pearl of the orient. In 1997 Hong Kong was thrust onto centre stage for the handover of sovereignty between two countries which were but a hundred years ago, two of the greatest symbols of imperial dynastic power that had ever existed. How the two had taken such divergent paths. How fitting that their paths should intersect the way they did on July 1st 1997. The lion ceded to the dragon that which it had appropriated 99 years ago. Years of British rule has left an indelible mark on the island. While the great powers in Europe toyed with high taxation, rigid economic structures and, dare I say, universal suffrage, Hong Kong was left to find its own dynamic free-trade equilibrium while under the rule of what was, essentially, a benevolent dictatorship. Hong Kong prospered in the way that a man who owns a money tree might. Despite an exorbitantly expensive airport project being approved just prior to the handover, the dowry of some 800 billion dollars given to China as part of the “package” was not insubstantial. This is where I grew up. Among my classmates there existed over fifty different nationalities. Sons and daughters of expatriates, they would come and go with the precession of the equinoxes. There was never any real sense of permanence to anything. Living in Hong Kong was living in a time warp, everything would happen faster, buildings would be built to towering specifications only to be dwarfed months later, people changed mobile phones at an alarming frequency. There was a sense of urgency about everything. Travelling and living around the world has made me realise just how special a place Hong Kong is. This is a microcosm of the modern world, seen and experienced in fast-forward, albeit with a few differences which, upon closer inspection aren’t quite as different as one might think. Despite being quite an advanced society, China has the audacity to claim that the people of Hong Kong are “not ready” for democracy. Perhaps this is true. However, as Winston Churchill so famously said “Democracy is a damned bad system of government, but nobody has thought of a better”. Inspired by Einstein’s words – “the world is a dangerous place to live, not because of the people who are evil, but because of the people who don’t do anything about it”, I took to the streets of Hong Kong with some 500,000 other people to call for democracy and the resignation of our incompetent puppet of an appointed chief executive, Tung Chee Hwa. It was here, in the sweltering heat, in this common action towards a common goal, that I found a sense of identity in the turbulent and ever-changing world of Hong Kong. It is in such actions that the true identity of one from Hong Kong is defined. As the world changes, boundaries previously set by ethnicity, religion and language give way to those set by one of the great “isms” of the modern era – idealism. The idealism shared by the people of Hong Kong differs somewhat from the vision held by our masters from the mainland. That being a vision in which “one country” takes priority over “two systems” and paternal non-consultative despotic government is the rule. Some say being from Hong Kong is about what you eat (oh, the glorious food in Hong Kong! ), what you wear and, to some extent, what you look like (among other things). But the world is changing. These boundaries are being blurred, not just in Hong Kong, but all over the world. Just as it is in Hong Kong, people all over the world are haunted by the pervading feeling of helplessness as a consequence of events which are out of our control. The truly unique element shared by “us Honkies” is the intense sharing of those grievances which result from being the unwilling participants in an idealistic tug of war between eastern and western influences. The future looks pretty bleak. 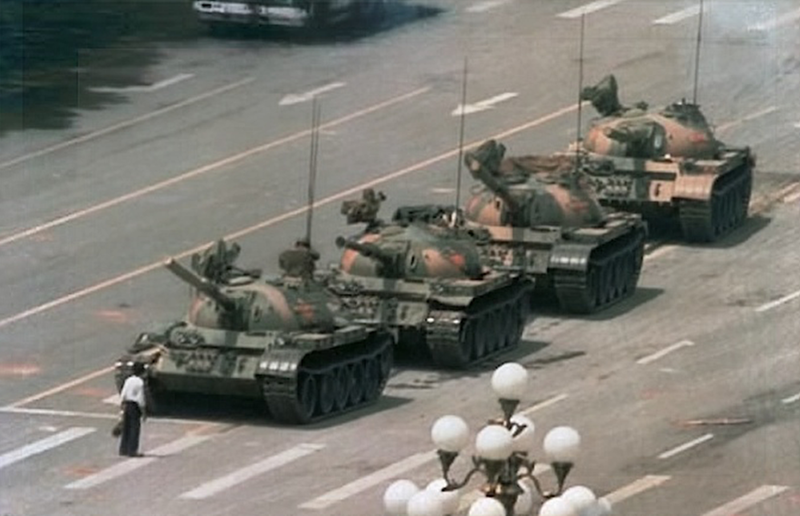 At times like these, I draw strength from the now famous photograph of the lone student protester blocking the road of a column of tanks somewhere near Tiananmen Square on June 4th 1989. I am inspired not only by the bravery of the student, but also of the driver of the tank leading the column. At that time, he was under orders to run the man over, but chose not to. Sometimes inaction is as powerful weapon as, well, a column of tanks. Watching the events of that encounter unfold gives me immense hope, hope for the future of Hong Kong and, for that matter, the rest of the world. After all, if one slightly wacko student can stop a column of tanks, there may still be hope for the 30,000 or so which attend this university.